During the first quarter of 2014, the Society of Collision Repair Specialists (SCRS) focused efforts on researching, collecting and analyzing rental and estimate data to better understand how the information can predict a more accurate expectation relative to time for repair. The project was initiated due to an increase in concerns from the repair marketplace as some property & casualty carriers increased their insistence that repair facilities agree to repair time frames using unrealistic expectations, and to indemnify the carrier for rental expenses beyond those terms. Loss-of-use or rental insurance is an optional coverage offered by many insurance carriers. The policy, sold for an additional premium, is intended to cover the cost of a rental vehicle for policyholders who have incurred a loss and are without their vehicle for a period of time either due to necessary repair or replacement. The policies often contain restrictions, such as capitation on the amount of coverage per day, or an overall cap on the total rental expenses that will be covered. 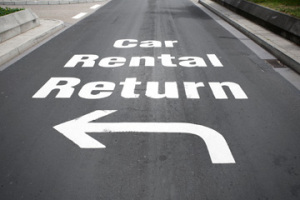 To research the issue SCRS reached out to estimating system information providers (IP) and rental car agencies, seeking data specific to the average length of rental and average hours per claim captured during the 4th quarter of 2013. SCRS obtained statistics produced by CCC Information Services, Inc. (CCC) and Mitchell International (Mitchell) relative to average hours per claim, and information published by Enterprise Rent-A-Car (Enterprise) and provided by The Hertz Corporation (Hertz) reflecting the average length of rental. While cross referencing each data set against the others produced a variety of results, no combination of data supported an expectation even reaching 3.0 hours per day. Results were factored by dividing average hours per claim by average length of rental. As an example, when SCRS compared average hours per estimate data from provided by CCC against the Enterprise average length of rental, a 30 hours job could be expected, on average, to take an estimated 15 days to repair; reflecting a median multiplier of 0.5. In the Q1 2013 Auto Physical Damage edition of its Industry Trends Report, Mitchell reported, “the median multiplier (multiply the number of labor hours per repairable estimate and you get a good approximation of rental days used) for the 49 states is 0.47 with a standard deviation of .05 indicating a fairly tight distribution.” This means, per Mitchell’s calculations, a repair order with 30 hours of repair labor could be estimated to take roughly 14.1 days for completion with a reasonable level of accuracy. When looking at 2013 Q4 data from Mitchell, and comparing the information against the Enterprise Rent-A-Car length of rental report, featured in the Q1 2014 Industry Trends Report, SCRS’ resulting calculations actually indicated a slightly longer expectation, but the differences could be based on the inclusion of all 50 states, fluctuations in length of repair from Q1 2013 to Q4 2013 or other potential variances in the analysis. For insurance companies using a 6 hour per day calculation, the customer is provided with an expectation that a 30 hour job would be completed in 5 days. For other companies that use a standard of 5 hours per day to calculate preliminary length of rental, they are suggesting that a 30 hour repair would be completed in 6 days. “The resulting calculations demonstrate the huge level of disparity between reality and expectation,” added Schulenburg. “Unfortunately, these false levels of expectation add waste into the repair process by creating costly and unnecessary administration for both the repairer and the rental agency, and can almost assuredly factor in a level of frustration for the consumer that could be avoided if we used better information to set their expectation at the onset of the process. The objective should be to set an expectation that will produce a consumer experience that lives up to what was promised; unfortunately, if we use bad data to establish the metrics, we are setting ourselves up for failure from the beginning. SCRS National Director Dusty Womble took the results of the study and applied them to a test in his own business, Roger Beasley Collision Center in Austin, Texas. Traditionally, his organization did their best to avoid committing to a time for repair until a thorough disassembly and blueprint was created; but customers were often being instructed by their carriers of an estimated time for repair as they provided preliminary rental vehicle approval. After participating in the board analysis of the collected data, they made a decision to give their consumers an estimated time for repair by dividing total labor hours by 2.0 hours per day, explaining the complexity and the challenges involved in the repair process, and the many factors that go into the repair aside from just the physical labor; all of these things which make it difficult to give an exact timeframe. For more information about SCRS, or to join as a member, visit our website at www.scrs.com. About SCRS: Through its direct members and 43 affiliate associations, SCRS is comprised of 6,000 collision repair businesses and 58,500 specialized professionals who work with consumers and insurance companies to repair collision-damaged vehicles. Additional information about SCRS including other news releases is available at the SCRS Web site: www.scrs.com. You can e-mail SCRS at the following address: info@scrs.com.